June 8, 2010 - Middle River Aircraft Systems, a part of GE Aviation, announced that it is expanding its employment by 200 new jobs in the state of Maryland by bringing the Company’s employment at its Middle River facility to more than 1,000 over the next year. “We have an 80-year lineage in Baltimore and have a great partnership with Maryland. We want to accelerate our growth in the State,” said Sagar Patel, president, Mechanical Systems for GE Aviation. Patel was joined at the event announcing the jobs by U.S. Senator Barbara Mikulski, Lieutenant Governor Anthony Brown and Gene Hans, president, UAW local 738. “Today’s announcement was about jobs, jobs, jobs. Jobs here in Maryland, where they mean economic security for more Maryland families,” Senator Mikulski said. "It is great news to have such a world leader in innovation as GE and Middle River Aircraft Systems, who are hiring up to 200 new employees, continue to expand in Maryland," Governor Martin O'Malley said. “It’s businesses like Middle River Aircraft Systems that help in our efforts to create jobs, protect jobs, empower small businesses, and defend the hard-won progress of Maryland's hard-working families." In the last five years, GE has invested more than $200 million in the Middle River facility and new program investments. The 200 new jobs will support the development and manufacturing of the GEnx-2B engine thrust reverser for the Boeing 747-8 commercial aircraft. “We are creating 200 additional high-tech manufacturing jobs to support growth in next generation technologies that improve the fuel efficiency of current and future jet engines that will power commercial aircraft,” continued Patel. "I join Governor O'Malley and Senator Mikulski to salute GE and Middle River Aircraft Systems for investing in Maryland's human capital and creating new jobs in our state," Lt. Governor Brown said. "We are proud of the partnerships we have forged with the private sector and look forward to continuing our work with GE and Middle River Aircraft Systems to strengthen and grow our middle class." GE currently employs more than 1,700 people in Maryland at eight facilities. With the expanded jobs, GE will bring its total Maryland employment to approximately 2,000 employees across several facilities including those in Baltimore, Bethesda, Germantown, Glen Burnie, Hanover, Hunt Valley, Laurel and Silver Spring. 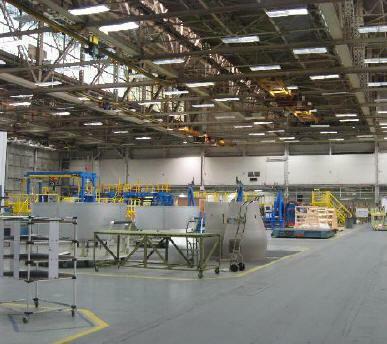 The Middle River Aircraft Systems facility in Baltimore is the focal point for GE Aviation’s efforts and currently employs more than 800 experienced engineering, manufacturing and operations professionals. Middle River Aircraft Systems is a part of GE Aviation, a world-leading provider of jet engines, components and integrated systems for commercial and military aircraft. GE Aviation has a global service network to support these offerings.